Most irritating driving habits | What Car? Tailgaters are the UK's most-hated road users. Nearly 40% of drivers questioned, in a poll by the AA and Autocar magazine, said that they were most irritated by motorists who drive too close to the car in front. Accidents and injuries are also more likely when motorists tailgate, according to the AA's president, Edmund King: 'Drivers were spot-on to highlight their irritation with tailgaters', he said. Data reveals that leaving pure human error aside tailgaters fall just behind "loss of control" as the major cause of crashes. 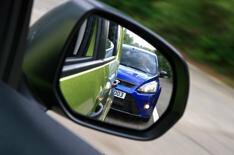 Police figures reveal that tailgating is responsible for 16% of motorway accidents.